The Grand Commander is the religious superior of the Professed Knights and of the Knights and Dames in Obedience. His duties include: spreading the principles of the Faith, supervising Priories and Subpriories, compiling reports on visits to be sent to the Holy See on the state and life of the Order, and seeing to the religious aspects of the activities of Professed Knights and Knights in Obedience. In particular he is in charge of instructing the members of the Sovereign Order in the fulfilment of the principles of Tuitio Fidei e Obsequium Pauperum (living the Faith and caring for the poor and the sick). The Grand Commander also takes care of the Magistral Palace Chapel and the organisation of pilgrimages. He acts as Lieutenant ad Interim in the case of the death, resignation from office or permanent incapacity of the Grand Master. He studied in Innsbruck at the Faculty of Law, and graduated in the spring of 1962. He then studied philosophy at the Università Gregoriana in Rome. After military service, he trained as a Lawyer, a profession which he practised from 1970 to 2002 in Innsbruck. 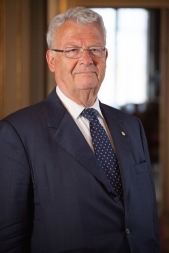 He entered the Sovereign Military Order of Malta in 1970, becoming a Professed Knight in 1984. He was elected member of the Sovereign council by the Chapter General of 1984 and was appointed Grand Commander of the Order by the Chapter General of 1994, position he held until 2004. He was elected Grand Commander again by the Chapter General which took place on 30-31 May 2014. See Grand Master / Lieutenant ad interim.